Here is a super simple quick and easy useful gift. 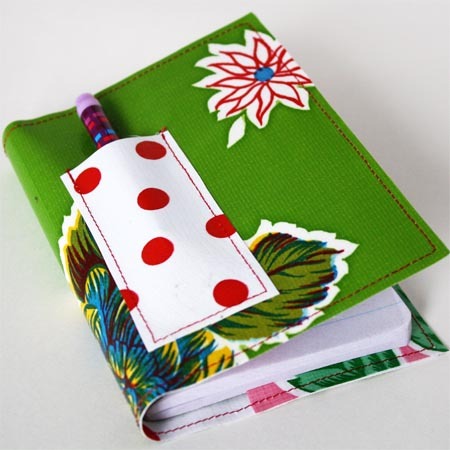 These little notebooks made perfect party favors for my daughter’s party! Sew pocket on front. Place it just shy of 3/4″ up from the bottom edge and over just over an 1 1/2″ from the side edge. Just eyeball where it works for you. Sandwich outside piece right side face down, then lining face up, and pocket pieces on each end. Fasten with mini clothespins. Sew all the way around the edge, removing clips as you sew along. I sew on the top side. 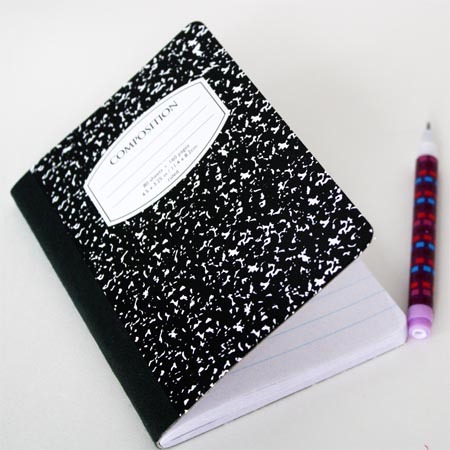 Get a mini composition notebook (found at Wal-Mart) and a mini pencil. I found my pencils at the dollar store. A golf pencil would work also. 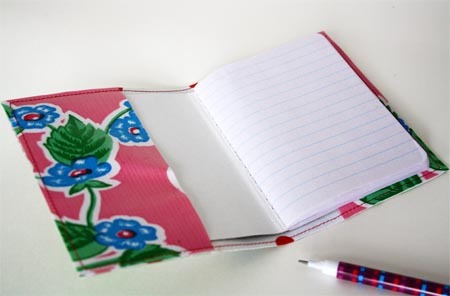 There you have one cute little cover! So easy to whip up a bunch in no time! These are so fabulous and will be a perfect addition to your 'Simple Reversible Tote Bag" that I'm making for my grandson's teacher for Christmas! 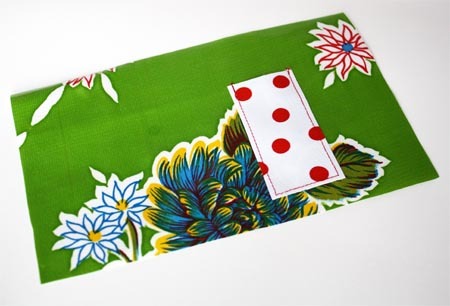 Can I use regular fabric and/or laminated fabric instead of oilcloth? If I use regular fabric, would I need to add some iron-on Pelon to make it stiffer? These are really adorable. 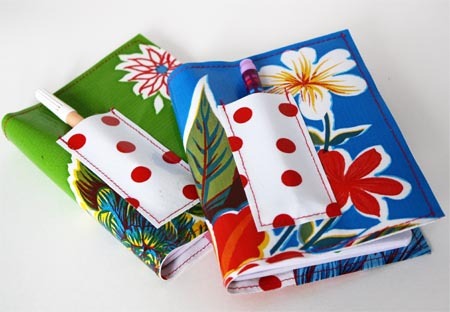 I have made some from cotton fabric for the full size composition books but the using oil cloth is a fabulous idea it can be wiped off and you don't have to finish the edges. This is going to make a great project for my 4-H kids. Thanks so much for sharing. 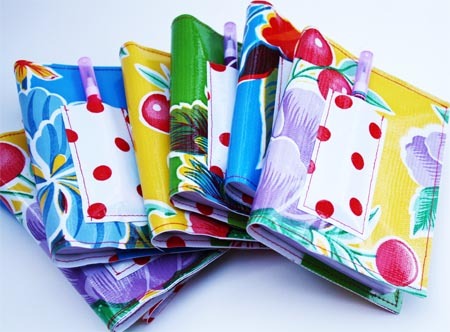 Where do you buy oilcloth? Thanks for sharing. I have a more complicated pattern to make these, but I love the simplicity of this one and will make a few, today! Desejo receber novidades no meu e-mail.Obrigada. This is soooo cute!!! I m soooo gonna make that! I luv it! Very cute! They look so bright and cheerful. I will put a link to your tutorial on my site if you don't mind. Thanks for the tutorials. I find so many great ideas on your site. Colorful, cute and practical. I love it. Well... I barely sew, but this is simple enough even for me! 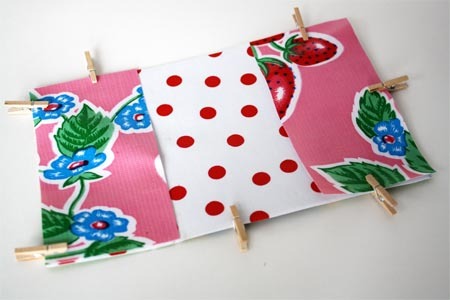 I've never used oilcloth, but this is a great use for it - thanks! Where can you find cute oil cloth and in small pieces? In the city I have to shop in all they have are solids and you have to buy a huge, long piece. This is such a cute idea. What a cute idea! 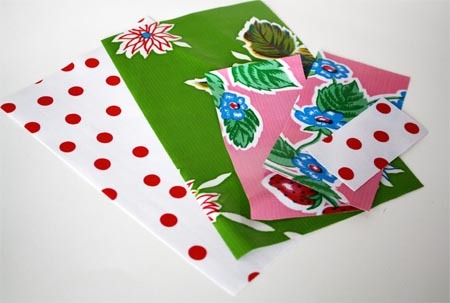 I love oilcloth and these are so easy to make. Thanks! I am in love with these! 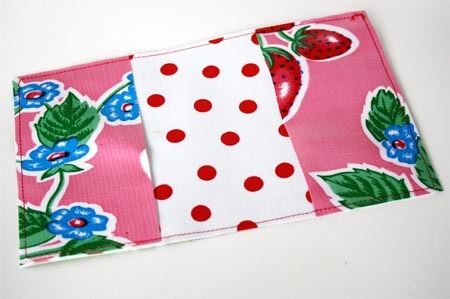 I love oilcloth fabrics! so good! love it. One day I'll buy some oilcloth. WOW - your site is just stuffed with so much inspiration! Thanks & Happy Trails! These are really darling! What kind of needle do you use for oil cloth? I use a regular sewing needle. If you have problems with the oil cloth not sewing nicely (sometimes it sticks to the presser foot), try placing masking tape on the bottom of your presser foot to help it glide through. so does it need to be oilcloth or do you think a thick cotton or work ok too? thanks! so so cute! Oh Cindy....oilcloth makes my heart skip a beat! So cute!!! WOW! Those are really cute! I want a sewing machine SO bad. I'm adding this to my "sewing" favorites folder!! Thanks for sharing!